The exhibition renders homage to all the voluntary hospitaleiros who constitute the keystone for the Jacobean route using a select collection of photographs by Manuel G. Vicente. The photographs, which were taken in recent decades, from the endo of the nineties until the present time, show the important function of the voluntary hospitaleiros in hostels and at points on the Camino de Santiago. 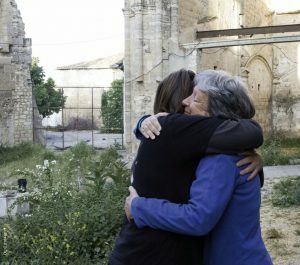 Thus, through the photographs, we can see in depth the generous mission undertaken daily by the Associations o Friends of the Camino and the voluntary hospitaleiros all over the world, flooding the Jacobean Route with the essence of fraternity and solidarity and disseminating the cultural and spiritual content of the Camino. The “Welcoming and Hospitality in the Camino de Santiago” exhibition could already be visited in Santiago de Compostela and is currently following an itinerary through the centres of the Jubilee of Mercy in Galicia. The Afundación centre in Ferrol hosts the exhibition from today until November 19, 2016. Visiting times are: from Monday to Saturday from 11 a.m. to 2 p.m. and from 5 p.m. to 9 p.m.